Nurse Practitioners are a key part of ensuring we have an excellent health care system. Some progress was made under the NDP government, but there was not a clear and continuing plan for the integration of nurse practitioners into health care delivery. One step forward was the implementation of seven quick care clinics, five in Winnipeg, which were run by nurse practitioners. There was also a gradual increase in nurse practitioners in access centres and a slow increase in nurse practitioners being involved in rural centres where there were no physicians. Sadly, the Pallister PCs are closing 4 of the 5 quick clinics in Winnipeg, have ended the Hospital Home Team, are closing the Corydon Primary Care Clinic and have terminated the positions of more than 20 nurse practitioners. While some will get new positions, there will be a net loss of nurse practitioner positions - the opposite of what it needed. The answers were very unsatisfactory, so I helped the Nurse Practitioners to organize a luncheon encounter to meet MLAs so that all MLAs would have an opportunity to meet with Nurse Practitioners and learn more about their situation and the need for action now (photo below). Hon. Jon Gerrard: (River Heights): Madam Speaker, I welcome Ashley Pylypowich, chair of the Nurse Practitioner Association of Manitoba, who's in the gallery today. Nurse practitioners are a very critical part of Manitoba's health-care team. David Peachey, in his report, recognized this, and, indeed, his report calls for a dramatic increase in the number of nurse practitioners in Manitoba, possibly as many as 500 more nurse practitioners than there are today. What is the government's plan with respect to nurse practitioners, including the plan to train and recruit the additional nurse practitioners who will be needed for our province? Hon. Kelvin Goertzen Minister of Health, Seniors and Active Living): We certainly value and appreciate the work of nurse practitioners. I agree they are certainly an important part of the pro­fessionals within our health-care system. I'm a little confused by the member for River Heights. He has spent the last many months trying to distance himself from Dr. Peachey's report, saying that it wasn't what he would do. Well, of course, that's what he said one day, and then he said he would do it, and then he said he wouldn't do it. So I'm not quite sure. Does he support Dr Peachey's report, or does he not support Dr. Peachey's report, Madam Speaker? As you can see from Mr. Goertzen's response, he has no plan with respect to nurse practitioners, and used almost all of his time in a diversionary discussion of the Peachey report. Mr. Gerrard: In a problematic report, there are some things which are worth looking at. Nurse practitioners are a really critical part–of our health-care system. And yet the minister has failed thus far either to meet with members of the Nurse Practitioner Association of Manitoba or to include members in decision-making committees like that for the Shared Services, Manitoba clinical teams or even in ongoing discussions on the future of health care in our province. When will the minister realize how critical nurse practitioners are and include them in his plans for the future of health care in Manitoba? Mr. Goertzen: Well, Madam Speaker, now I think we get a bit of a sense of what a true Liberal is: not quite sure from day to day what they're actually standing for. The–Dr. Peachey's report is an overall clinical plan. Now, it's true that it can't all be done at one time; it has to be staged, perhaps over many years, Madam Speaker, the different parts of it, and that is fine. But it's not a buffet where you take a little bit here or you take a little bit there and leave the rest of it over there. Dr. Peachey's plan is an overall comprehensive plan. Yes, nurse practitioners are an important part of that. We continue to value them. We will continue to value them. But I think he should come on-board with looking at the overall plan and not just picking and choosing so he can have a question one day in question period, Madam Speaker. The issue in my question is including nurse practitioners in planning moving forward. As you can see from Mr. Geortzen's response he completely avoided the critical issue which needs to be addressed. The honourable member for River Heights, on a final supplementary. 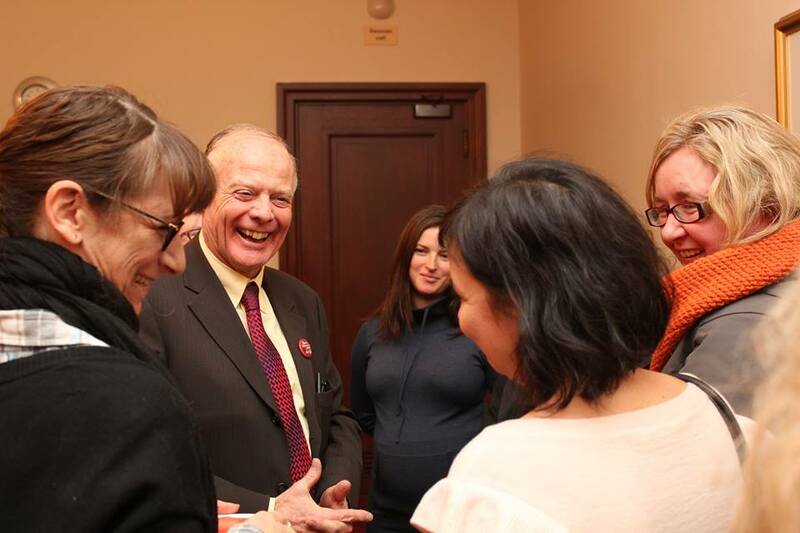 Mr. Gerrard: Madam Speaker, nurse practitioners run the Quick Care Clinics in Winnipeg. The minister is cutting four of these. Chop. Nurse practitioners are critical to collaborative-care teams like the Corydon Primary Care Clinic and the Hospital Home Team. The minister is cutting these. Chop. When we all know nurse practitioners will be critical in future health care and the Peachey report is recommending more nurse practitioners and a greater role for nurse practitioners, why is the minister cutting these nurse practitioners positions? Chop. Mr. Goertzen: Madam Speaker, the QuickCare clinics' resources are going to the ACCESS centre. The hours will be expanded, so there'll actually be more services. And you know what that member said? Nothing, Madam Speaker. [In fact the three Liberal MLAs went to Ottawa to call for strong funding for health care. And we would have done more but the Pallister Conservatives have not yet presented a good plan for health care in our province - including no plan for mental health or home care. It is very hard to make a strong case for additional funding if you don't have a good plan]. Overall, our Minister of Health, Mr. Goertzen, gets very poor marks when it comes to addressing the issues of nurse practitioners. Including nurse practitioners in our health care system is a vital aspect of improving health care in Manitoba. A robust plan is needed. We are not there yet. The Minister of Health et al is side stepping issues because there is no plan. When I worked in the Respiratory Hospital in the 1970s, they had probably the first nurse practitioner perhaps in all of Manitoba. There is a need for additional health care professionals, such as the nurse practitioners and it has taken a very long time for them to be recognized and valued in our health care system. This is the cutting edge age and versatile web is the great creation in this period. You can interface effectively where you can visit website for the assistance of the versatile and it is a decent chance to the general population. This is an incredible innovation and it is useful for what's to come.